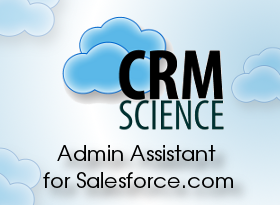 Our Admin Assistant extension provides Salesforce.com administrators (and developers!) with additional time-saving tools and settings shortcuts to facilitate the day to day functions and responsibilities they may be faced with. If you attended the PhillyForce meetup during Philly Tech Week, you may have seen my session on my Salesforce Chrome Extensions. If you didn't, check out the recorded demo of that session at the bottom of this post. As Salesforce.com user, have you ever had the feeling that "there should be an easier way" or have stared at a long list of check boxes and thought, "I have to do this for every one of these?" These are the reasons I created the Admin Assistant extension. Maybe you're testing a new piece of Apex code or building out a new workflow that generates a lot of junk records. How many times have you wanted to delete a few of these records and been in this situation? Deleting each of the four Contact records above would require you to click on the "Del" link on each row, confirm that you want to delete the record, rinse, and then repeat multiple times. Various Profile Settings: At the field level, check or uncheck all of the "Visible" or "Read-Only" boxes. At the Object level, check or uncheck all of the CRUD/View All/Modify All boxes. For Tabs, quickly display or hide all Salesforce tabs.